Tiger Woods won the Players Championship for the only time in 2001, taking home a $1 million first prize. 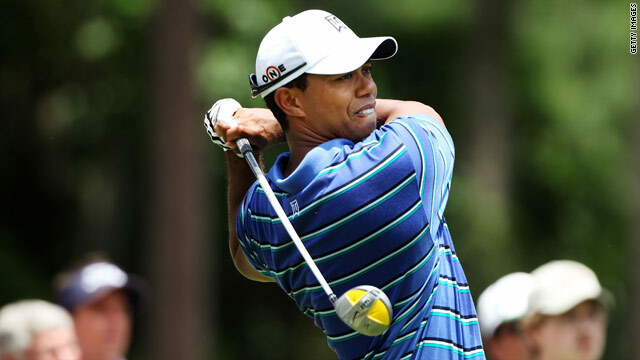 (CNN) -- Tiger Woods made a solid start to the Players Championship on Thursday, as he seeks to avoid missing the halfway cut in successive tournaments for the first time in his career. Woods, who can lose his No. 1 world ranking if he finishes outside the top five and Phil Mickelson wins the $1.71 million first prize, carded 70 -- a score he has never beaten in the opening round of the PGA Tour's flagship event. It could have been better, but for a dropped shot at his final hole that left the American four shots behind leaders J.B. Holmes and Robert Allenby, who profited in the benign conditions. It meant he ended the day in a logjam of players on two-under-par including Masters champion Mickelson who, starting on the back nine, carded four birdies and two bogeys. It was a welcome return to form after Woods failed to make the weekend rounds at the Quail Hollow Championship, his first event back on the regular tour following his comeback at the Masters. The 34-year-old admitted this week before the lucrative tournament at Sawgrass in Florida that his golf is still being affected by his personal problems, and he again struggled off the tee but managed to save par in his first eight holes. When he picked up a shot at the par-five ninth it was his first birdie in 19 tournament holes, and he repeated the feat at 11 and the par-four 15th. Woods safely negotiated the notorious 17th hole with a tap-in par, but suffered his only blemish at the last after his tee shot went into the water. "I played solid today, I hit some good shots and bad shots," he said before referring to his lack of recent action: "I've played six competitive rounds in seven months." Holmes set the early clubhouse target as the American carded a bogey-free 66, while Australian Allenby had been out front on his own before dropping a shot at his second-to-last hole, the eighth. Eight players were tied on 67 including 2005 joint runner-up Luke Donald and his fellow Englishman Lee Westwood, second at the Masters behind Mickelson, with another bunch on 68. Defending champion Henrik Stenson was in another big group on 69 as he carded an eagle, four birdies and three bogeys to be level with the likes of Vijay Singh, Jim Furyk, Davis Love and K.J. Choi. Rory McIlroy, the young Irishman who won at Quail Hollow after a sensational final round of 62, struggled with a 73 that left him tied for 105th along with three-time major winner Padraig Harrington. South African veteran Ernie Els, who won two PGA Tour tournaments in March, may also miss the cut after carding 74.